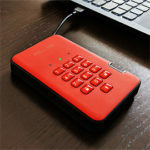 Furthermore, the Deco M5 uses the MU-MIMO technology to connect the nodes between each other, but also to connect to any compatible clients. 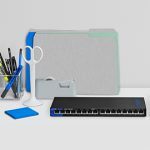 The MU-MIMO tech (Multi-User Multiple Input Multiple Output) allows the router to simultaneously serve multiple clients at the same time, instead of letting them compete for the bandwidth (before, one client was served at a time). 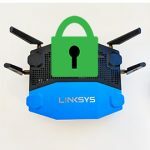 As with every other recent networking technology, the MU-MIMO suffers from a lack of compatible devices (sure enough, steps have been taken with some high-end smartphones, but it still remains a viable option for bridging between two routers). Furthermore, there’s also the BeamForming feature (something to be expected from all new routers) which has the role of focusing the signal directly towards the clients instead of broadcasting it everywhere. 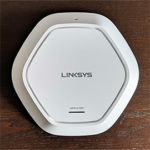 In order to test the wireless performance of the TP-Link Deco M5, I took one router unit and connected it to the Internet. Next, I connected two computers, one is a Desktop PC equipped with an ASUS PCE-AC88 4×4 WiFi adapter (will function as the client), while the other is a laptop equipped with an Intel 2×2 WiFi adapter and will work as the server (gets connected via cable). This way, I measured the data transfer rates at different locations inside the home. From the client to the server, at no more than 5 feet, I managed to measure an average of 632 Mbps (the first time I tested, I got 490 Mbps) and, after increasing the distance between the client and the node to 15 feet, the speed decreased to 622 Mbps (instead of 331 Mbps). At 30 feet, I measured no more than 328 Mbps (136 Mbps). From the server to the client, I measured an average of 350 Mbps, while at 15 feet, I got around 344 Mbps; at 30 feet, the speed went down to 274 Mbps. This is a dramatic increase over the last time I tested the device, so it’s clear that TP-Link has focused a lot more onto delivering a better performance using a single node. Afterwards, I took the second Deco M5 router and connected it to the network. This way, from the client to the server, at no more than 5 feet, I measured an average of 241 Mbps (the first time, I got 265 Mbps), while at 15 feet, the speed increased to 268 Mbps (188 Mbps), so the two-unit system does recover after a distance increase. Lastly, at 30 feet, I measured an average of 136 Mbps (110 Mbps). From the server to the client, I measured an average of 176 Mbps at 5 feet, while at 15 feet, the speed remained consistent to 174 Mbps; at 30 feet, I measured an average of 112 Mbps. Afterwards, I added the third node to the network (at about 35 feet from the first node, but with a thick wall in between them) and once again I connected the compatible client. From the client to the server, at 5 feet, I measured an average of 233 Mbps (consistent to what I got the first time: 234 Mbps) and after increasing the distance to 15 feet, I measured no more than 211 Mbps (160 Mbps). At 30 feet, the speed went down to 115 Mbps (89 Mbps). 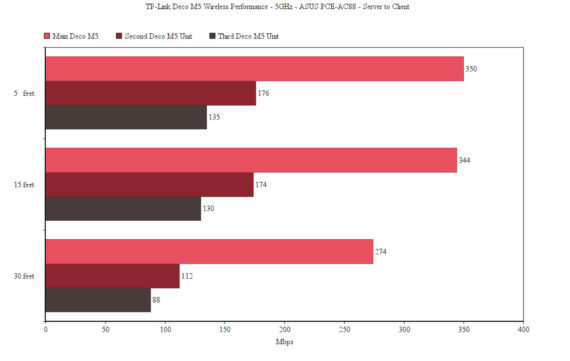 From the server to the client, I measured an average of 135 Mbps at 5 feet, while at 15 feet, I got around 130 Mbps; at 30 feet, the speed decreased to an average of 88 Mbps. Next, I decided to use a 2.4GHz client to test the wireless performance: from the client to the server, at 5 feet, I measured up to 178 Mbps (149 Mbps), while at 15 feet, the speed decreased to 132 Mbps (120 Mbps) and at 30 feet, it went further down to 97.6 Mbps (96 Mbps). From the server to the client, I managed to measure an average of 174 Mbps, while at 15 feet, I got 168 Mbps; at 30 feet, I measured an average of 147 Mbps. 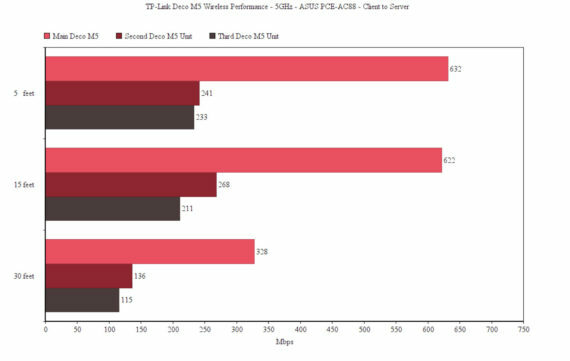 Since the Deco M5 takes advantage of the MU-MIMO technology (and, hopefully this tech will be more widespread in the future), I took three laptop with compatible MU-MIMO wireless cards and still keeping the three-node system, I got the following results (I did not redo this part of the test, so the results are from the first time I analyzed the product): at 5 feet, I measured an average of 76 Mbps, while, at 30 feet, the speed decreased to 35 Mbps. 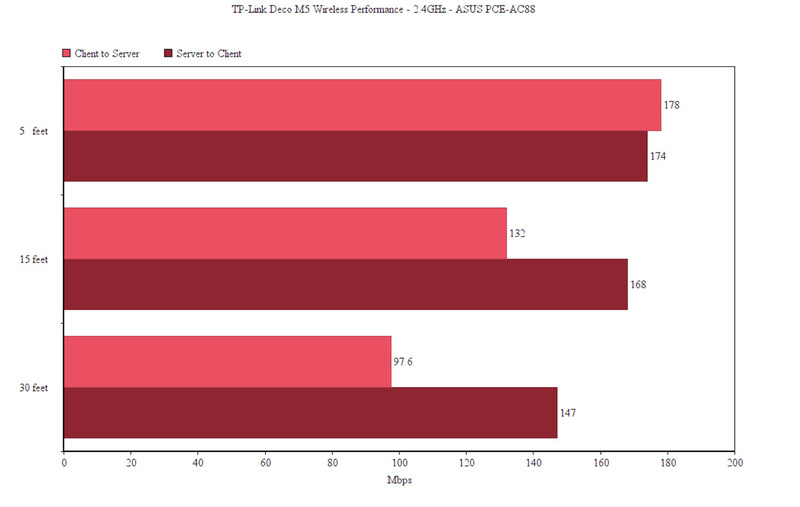 Using a single node, I measured no more than 134 Mbps at close range (5 feet) and an average of 82 Mbps at 30 feet. 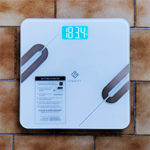 Note: A single TP-Link Deco M5 should be able to cover up to 1,500 square feet, while the three units are advertised to be able to cover 4,500 sq. feet. 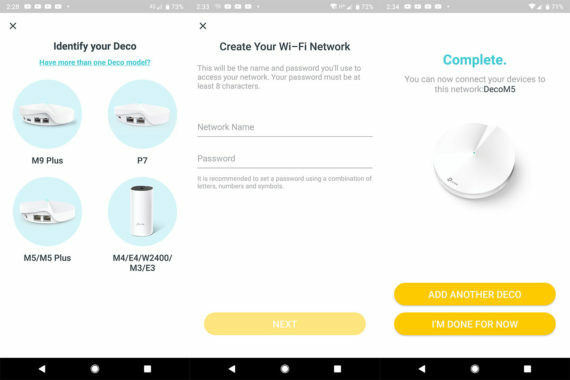 The setup process is very simple and intuitive (very similar to how Google WiFi handles things), so these are the steps that you have to follow: first, you need to download the Deco app by either scanning the QR code or accessing the app store (available only for mobile devices/tablets – compatible with Android and iOS), then you need to sign up or log into the app by using the TP-Link ID (if you don’t have one, the sign-up process will allow you to create it) and connect the first Deco M5 router to the Internet (usually done through a cable modem). 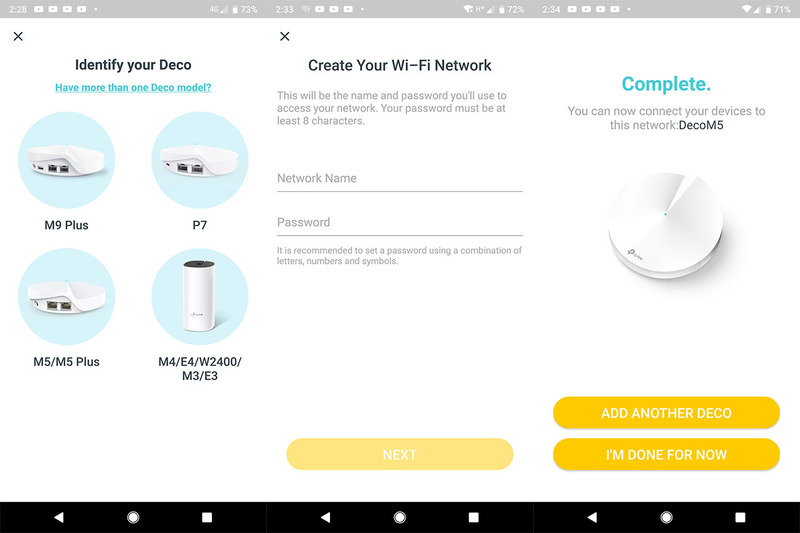 Next, the app will ask you to choose the location of the router, create a network name (SSID) and password and you can further add more Deco nodes to the network: to do so, tap Add another Deco and then, the app will help find the proper spot for the second unit, so it won’t be too far from the first one (the LED will flash a blue colour) and finally, after the app finds the second Deco, it will test the connection to make sure everything is working fine. And these are the steps to follow if you want to add more units. 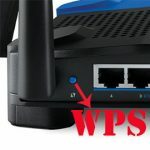 It’s clear that the installation process is incredibly easy to follow and it’s one of the simplest I have encountered on a router or WiFi system (it rivals the simplicity of the Google WiFi). TP-Link Deco M5 lacks a web-based utility and the only way to configure and maintain the network is by using the mobile app. 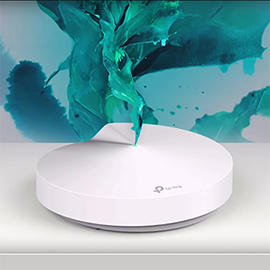 This seems to also be the preferred approach for Linksys Velop and Google WiFi, both persuading people to give up the good ol’ PC interface and take the mobile-only road. I won’t argue that the current setup is easier done on a mobile phone than on a computer and it certainly attracts a larger audience which before was scared to delve into the complicated world of networking. But, I feel than the correct approach would be to keep the web-based interface since it gives people more control and freedom of choice (this way you can easily fine-tune everything about the network – something which is pretty much unattainable using a mobile app). Perhaps in the future, the PC utility may become obsolete, but I don’t feel that time has come just yet (and the lack of freedom will definitely annoy tech-savvy people). The mobile app has a main Dashboard which shows the status of your Deco M5 nodes (along with the location), the Download/Upload speed, number of connected devices and there’s a link to the main menu. If you swipe right, you get the possibility to Create a New Network, access Help and About. 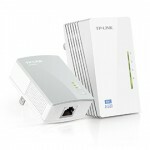 The main menu has the following options divided into two main sections: Router Settings and HomeCare. 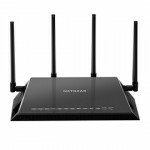 The Router Settings include the WiFi settings, Test the Internet Speed, Blacklist, Update Deco, Advanced and WPS. 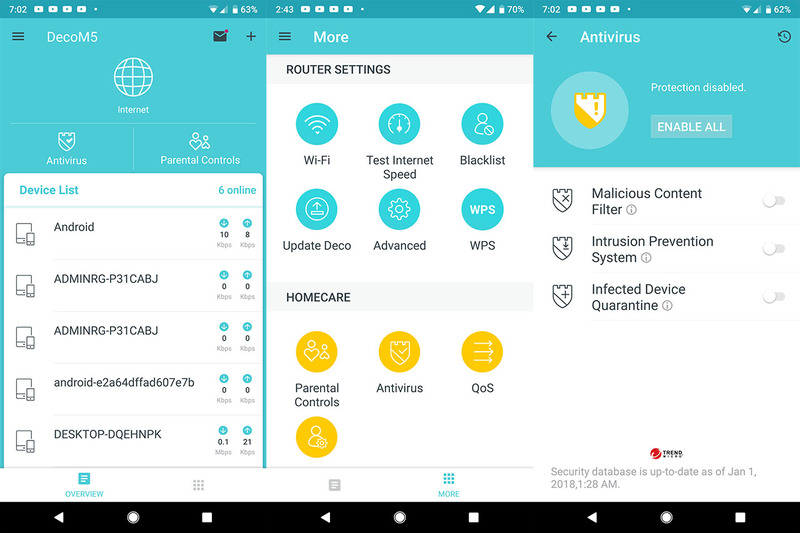 The WiFi settings allows you to change the SSID and password, enable the Guest Network (with its own SSID and passkey) and, optionally, you can set to share the Main Network or the Guest Network details by shaking your phone. 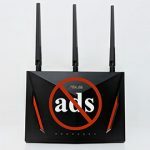 The Blacklist allows you to block the Internet access to certain Clients or Other Devices, while the Advanced settings include IPv4 and IPv6, VLAN configuration, Address Reservation, Port Forwarding, TP-Link DDNS, Fast Roaming, Operating Mode (Router or Access Point Mode), Notifications and more. The WPS is a recent addition to the the Deco M5, but it is worth reading this article before deciding to use it. Under HomeCare, you can find the parental Controls, the Antivirus, QoS and Managers. 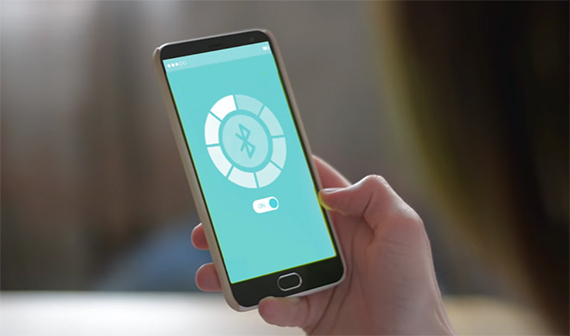 The Parental Controls allows you to create profiles for every person in the house, select which devices are used by them, create filters (can be Child, Pre-Teen, Teen or Adult – select which categories to block (Adult Content, Gambling, Games) and which Apps or Websites shouldn’t be accessed) and create schedules for each profile (Time Limits and Bed Time). Furthermore, you’ll get monthly usage reports (with the network activity) which are sent automatically to your phone. 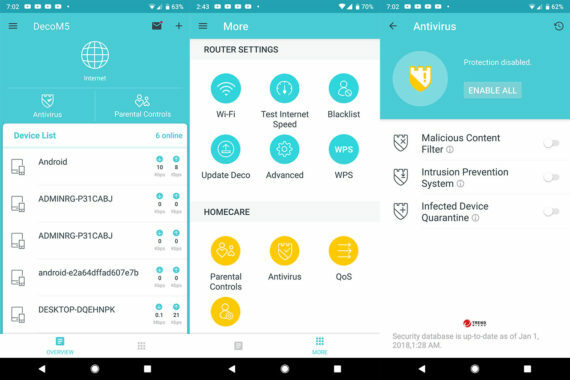 The Antivirus section is TP-Link’s manner of adding something new to the way WiFi system work and it has the role of protecting your system and the connected devices from external attacks, it also has the role of blocking any malicious websites, as well as preventing any infected device from sending any important info outside the network (by adding them to the quarantine). The Antivirus feature is provided by a third-party, the Trend Micro and comes as a fully-activated software for three years and only available for the three-unit pack. After the three years have passed, you have to sign up for a monthly fee if you want to continue using this Antivirus, otherwise, some of the features may no longer work or will function in a limited capacity. Some may wonder if a continuous analysis of the data stream (to detect any anomalies) should raise some concerns about privacy. Well, yes, but not much more than the antivirus in your computer, since they function on the same parameters (this article made some valid points about data tracking and the antivirus software). The QoS section allows you to prioritize specific devices for a period of time and you can also prioritize an activity (gaming, streaming, surfing, chatting or downloading). The Managers section allows you to include additional managers, each with their own TP-Link ID, so they also get access to all the settings of the app. 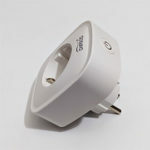 Note: Just like Google WiFi and many other WiFi systems, the Deco M5 stays connected to TP-Link’s servers all the time, so, some information can and will be collected from your network. TP-Link Deco M5 is an interesting WiFi system which takes advantage of the mesh technology, supports MU-MIMO data streaming, has a really good wireless performance (even if it’s just dual-band) and it has an incredibly simple installation process – over the last two years, TP-Link has improved the wireless performance, especially for the single-node and the user interface feels more stable and has more features. Of course, there are some things that I disliked, such as the lack of a web-based interface, the lack of more advanced settings and I have mixed feeling about the Trend Micro Antivirus which is a good concept, but it is not indefinitely part of the system and the people who don’t get the three-unit pack will completely miss this feature. 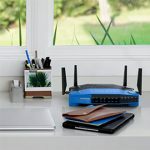 That being said, it’s still a good mesh system and considering its price, it definitely worth taking into consideration if you have to cover a large house or an office with WiFi.